Change—but no change. John Key’s sudden resignation as Prime Minister has changed the political game in New Zealand but his successor is unlikely to signal a significant shift in foreign and defence policy. National party MPs will on 12 December confirm Bill English, Deputy Prime Minister and Minister of Finance, as Key’s successor. He and Key built a close working relationship and a high level of agreement on economic policy. But the change of leader is almost certain to lower the National’s electoral appeal and improve the chances of a combination of Labour and the Greens winning the next general election due by November 2017. A change of Government would lead to a less open trade policy—both parties opposed the Trans-Pacific Partnership (TPP)—a more wary attitude to committing troops apart from peace-making and peacekeeping missions, and a stronger assertion of New Zealand’s independent foreign policy. 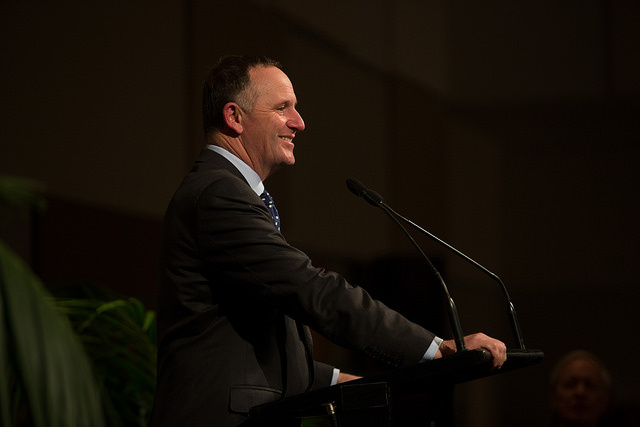 Key has been a highly popular Prime Minister since 2008. His approval ratings had eased a bit in this (post-2014) three-year term, but they remained high. His combination of smart, optimistic blokeyness has been worth upwards of five percentage points to the party. The National Party won 45%, 47%, and 47% of the vote in the three elections Key contested as leader. In November the party averaged 48% in opinion polls. Under New Zealand’s highly proportional mixed-member electoral system, Key was able to govern with the support of three small parties, which gave his administration consistency and stability. There was a real possibility he and the Nationals would have won a fourth term in the election. That prospect is less assured now. Key’s unforeshadowed resignation stunned his colleagues. He had raised a possible departure only with his immediate family and English back in September. Publicly Key said then he intended to fight the 2017 election. But on 5 December he said that he couldn’t look interviewers in the eye and say he would serve out a whole fourth term. Two days before the Nationals had a heavy defeat in a by-election in an Auckland electorate vacated by former Labour leader Phil Goff when he became Auckland mayor in October. Key campaigned hard for the Nationals candidate, including on each of the three days leading up to Election Day. Two ministers (so far) want to be Deputy Prime Minister to English: ninth-ranked Transport and Energy Minister, Simon Bridges, and fourth-ranked Climate Change, Social Housing and Associate Finance and Tourism Minister Paula Bennett. English yesterday nominated Economic Development Minister Steven Joyce as his successor as Finance Minister. But some MPs were reported to want regeneration, a factor in Bridges’ bid to be deputy. English was leader from 2001–03 and took the party down to a disastrous 21%, a 100-year low for a major party. He lacks charisma. Key relied heavily on Foreign Minister Murray McCully and has broadly maintained the three-decades long ‘independent foreign policy’—edging nearer the United States, including sending troops to train Iraqi soldiers. Balanced against that is New Zealand’s growing trade dependency on China and Beijing’s growing influence with South Pacific island countries. China and New Zealand have a joint aid project in the Cook Islands and there’s some defence cooperation. English has shown little interest in foreign policy beyond trade. Whether he’ll keep McCully is unclear. And if the National Party wins a fourth term next year, it’s most unlikely to get enough votes to govern without including in its coalition Winston Peters, who heads the economic-nationalist New Zealand First party. Peters didn’t block the 2008 free trade deal with China while Foreign Minister in coalition with Labour but he has been increasingly critical of recent trade initiatives, including the TPP, high net immigration and foreign investment. John Key wasn’t an executive prime minister. He devolved responsibility to ministers to whom he gave wide latitude and backed them—particularly English’s fiscal consolidation (confirmed on 8 December in a positive budget update projecting large surpluses through the next five years) and innovative ‘social investment’ reworking of social assistance, which has attracted the interest of the New South Wales and Australian federal governments. He backed performers and achievers in his cabinet and skilfully edged out ministers and MPs to make way for new blood. In pursuing New Zealand’s foreign policy interests he established effective personal working relationships with a wide range of political leaders from Barack Obama to David Cameron—as well as successive Australian Prime Ministers. Colin James is a political journalist and analyst. Image courtesy of Flickr user International Council for Science.